Let’s us imagine thousand of stars in the sky? Once you see the stars are shining up above the sky, you can’t take off your eyes from it. What if we put of thousand shining little stars on your eyes, and I think everyone just can’t stop looking at you. Recently I’ve been trying out this new eyeliner by Kiss me. It is called the Heavy rotation Shiny Jewel Eyeliner. This is a new product from Kiss me Cosmetic. 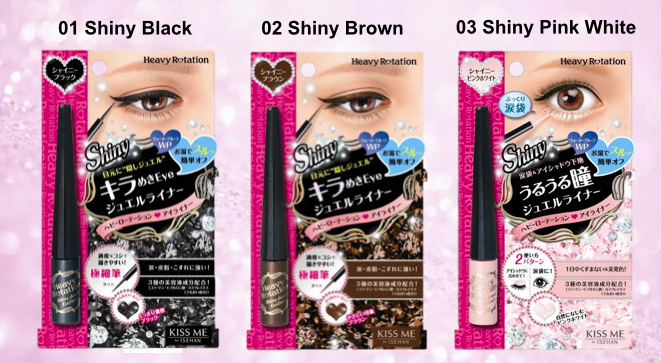 Kiss me Heavy rotation shiny jewel eyeliner come in three different shade. This eyeliner contain glitters that can instantly light up your eyes. It claims to give water, smudge and rub resistant. Beside that it contains 3 types of beauty essence- collagen sodium hyaluronate and chamomile extract. It has ultra thin brush for easy application. If you want to have a bigger eyes effect and more dramatic look, you can choose the black eyeliner. If you want more natural looking eye then you can choose shiny brown. If you want to have that effect to open up your eyes or as an illusion to have cute eye bag , then you can chose ethe pink white. 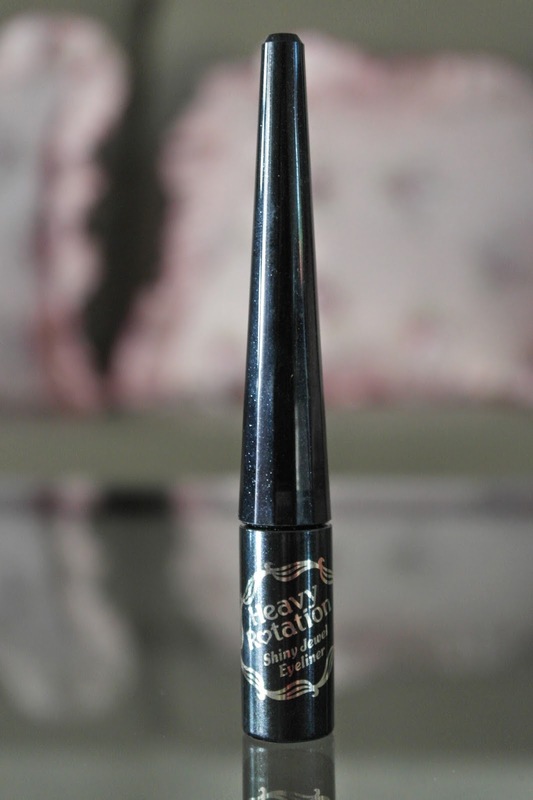 The applicator design with pointy tip and it is easy to control, it just glides on your eyelid. Pros: - dry quickly - don't smudge - The eyeliner contain fine shimmer, not too dramatic can be wear morning and night. - easy to remove using lukewarm water - easy control of the applicator and glides of easily on the eyelid. Overal, I like this eyeliner and it is becoming my everyday go to eyeliner. 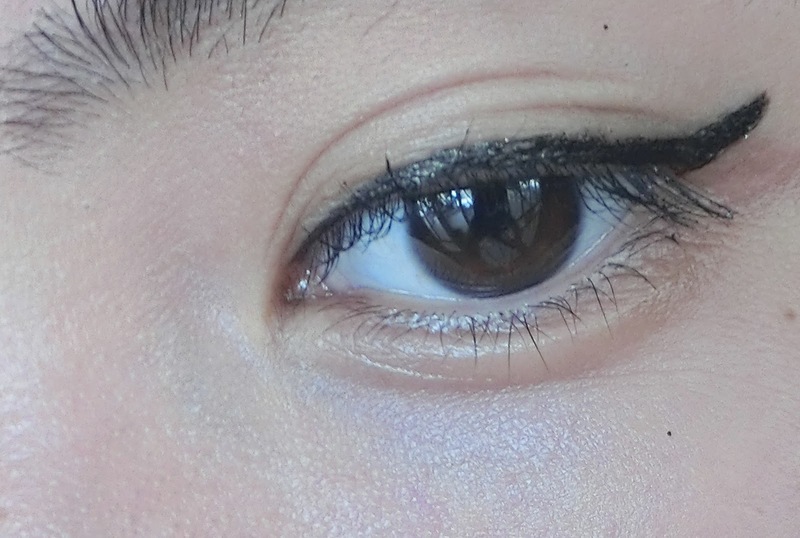 The weather is so hot recently, I don’t want my makeup to melt off, and this eyeliner really proven that it doesn't smudge although I'm sweating, so it is perfect for me. The colour payoff is great. This is a liquid eyeliner, and a problem with liquid eyeliner is that it is hard to draw but this is really easy to use, they provided a fine brush applicator, you can achieve to draw any kind of eyeliner look with it. It is also easy to remove the end of the day, you can use lukewarm water. It is selling at drugstore and at the price of Rm49.90, I think that it is quite expensive. But I'm happy that it doesn't smudge. 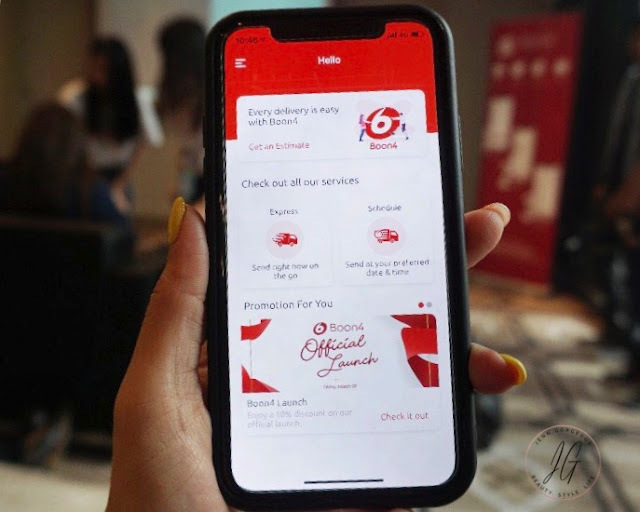 Disclaimer: This is a sponsored blogpost. I give my 100% honest review.